We spent two nights here to celebrate our anniversary and highly recommend these beautiful villas that opened Nov 1, 2011. Great attention to detail has been paid in creating each suite - from the door style to the light fixtures, everything is designed to make you feel like you're in Tuscany and they succeeded (except here everyone speaks English :-) You can read all about the amenities on their website. On our first night we took a ride in a beautiful white horse-drawn carriage. $10 for up to 4 people. It was so romantic as we wound our way down the road lined with white-light wrapped trees. On our first night we stayed in a king suite and our second night we paid for a two-level king suite. Both my hubby and I agree there's no real need to spend the extra money on the two-level room. While it's nice, the bathroom and closet are downstairs which, honestly, is a little inconvenient. Since the bathrooms aren't that big, you end up getting dressed in the living room or schlepping your clothes from the downstairs closet to the bedroom upstairs to get dressed. We stayed in the Siena villa, room 503, the first night and Verona 604 the second night. Each had fireplaces but, again, we like the single floor layout better because the fireplace is where the bed is . . . pure romance. In the two-floor layout the fireplace is in the living room downstairs. We spent very little time down there. :-) Also, if you or your spouse get up in the middle of the night to go to the bathroom, you have to navigate the stairs . . . Not safe or convenient when you are half asleep and it's dark. (The stairway has light but you know what I mean.) The villas are set around the lake which is a beautiful. However, there is an active railroad and on our first night a train came thru. It didn't last long but it sounded pretty close. Keep in mind that the doors into each villa and the doors of the suites themselves make a loud noise which reverberate thru the entire villa. Be kind to your neighbors and don't let them slam. Each villa has four suites that share a common area. The fridge in this area is stocked with complementary yogurt, water, soda and juices. There is also ice, a basket of fresh fruit and a microwave. You also have a fridge in your room (where we stored a couple of bottles of champagne). We loved the fluffy white robes from Restoration Hardware and there is a blue ray DVD player in each room. Bring your own movie and microwave popcorn for a lazy afternoon in bed. Breakfast was delivered in a wine box and left in the common area with the room number. There's an in-room coffee maker to brew your own. Breakfast was an assortment of fresh pastry and grapes. We had in-room couples' massages by Divine Touch - they were great. Wish we would have gotten the longer one! We had dinner one night at 91 Wood Fired Oven, just a short drive away. It was excellent. Dinner the second night was at The Bistro at Gervasi. We made reservations online. It was very busy but service was excellent and so was the food. We loved the wings, duck and fig pizza, and the apple and cheesecake desserts. The Bistro was decorated for Christmas and it was STUNNING! It's an old barn built in 1820 something and is full of character. We could not have asked for a better place to celebrate our anniversary. When our desserts arrived the chef had written "Happy Anniversary" in chocolate on the platter. So thoughtful! It was a perfect weekend with the exception of one incident. It's not really the fault of Gervasi's but it is something to keep in mind since you are sharing a common area. We were awoken at 2:15am with VERY loud talking and a screaming baby in the common area. There are signs posted asking people to be courteous, however, this woman was going on and on about her shuttle ride. After 5 min. or so, I got out of bed and poked my head out the door where I saw two Gervasi staff (I believe shuttle drivers given the conversation) and I just said, "seriously?" They hushed up but we couldn't fall asleep for a couple of hours and that morning she had her crying baby in the common area. Gervasi offered to give us the upgraded room we paid for in a villa where there was no one else, so we had a peaceful night. You would think people would have the common sense to keep their crying baby in their own room (which is nicely sound proofed). Believe me, other people DO NOT want to hear that. And how rude is it to be holding a complaint session at 2AM? Some people have NO common sense or common courtesy. It would be great if in the future Gervasi designated "kid-free" villas or set aside villas that are family friendly. They've only been in operation a month or so. Hopefully they will do some tweaking. Minus this inconvenience we enjoyed our stay and a we WILL be back. We had a wonderful time at the Gervasi Villa. We spent a night to celebrate our anniversary and are thinking about renting one of the villas to celebrate the holidays with our family. The accommodations are absolutely gorgeous, as are the surroundings. I would definitely go back and wouldn't hesitate to recommend it to others. I stayed with one of my girlfriend's at The Villas at Gervasi Vineyard and it was exquisite! The decor and atmosphere transports you to a place not recognized as Canton, OH. We stayed in one of the Double Queen luxury suites and it was very spacious. Plenty of room for 2 people and even 4 people. The bathroom was unbelievable... fully tiled, walk in shower, and a tv too! I would definitely recommend it to anyone looking for an escape or even just a nice place to stay. "No Passport Required" shut up, already! A Romantic Getaway: The Villas at Gervasi Vineyard by Robin Ott My husband and I recently enjoyed a much-needed night away together at Gervasi Vineyard, minutes from downtown Canton. 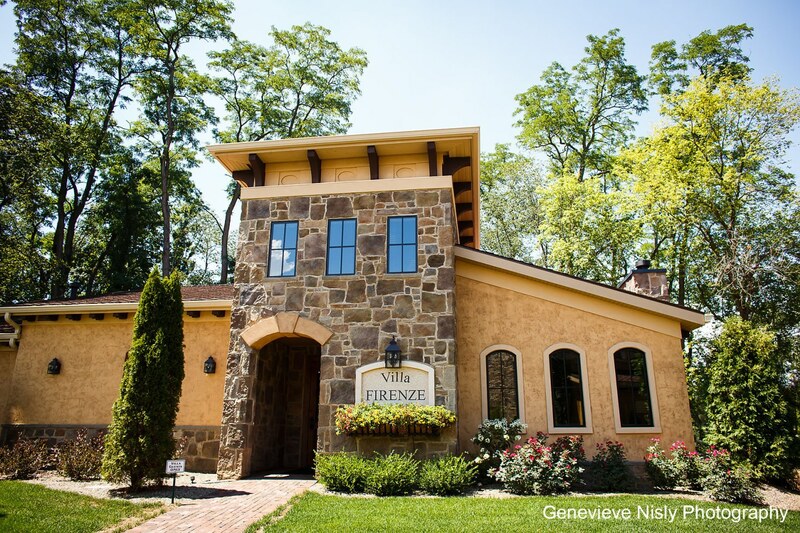 We have been to the Winery and Bistro in years past--Gervasi's owners take great pride in the quality of their wine and meals--and were excited to check out the recently completed boutique inn�The Villas. With our careers, a very active three-year old son and a newly adopted German Shepard puppy keeping us busy, a quick trip was just what we needed to reconnect and unwind. No detail has been spared from the architecture to the decor of this lovely 55-acre estate. The grounds include a winery, The Bistro, Marketplace gift shop, Tasting Bar, The Cucina Culinary and Wine Center, The Villa Grande Conference and Event Center, Outdoor Pavilion and The Villas. In addition, the natural surroundings include the vineyard, a spring-fed lake and a state park hiking trail. The Tuscan-inspired inn is both luxurious and rustic. There are 24 suites arranged in six, four-bedroom villas. We stayed in the gorgeous Villa Portofino named after a fishing village in Italy. Each villa has its own common area complete with rustic dining and living area, a stone fireplace and kitchenette. This set-up makes The Villas a perfect destination for several couples or families with older children to enjoy. Note to self: must arrange a couple�s retreat with friends, complete with an evening of great wine, food and games. And if we visit in warmer weather, add to the list: lounging with a glass of wine on our suite's lanai or dining al fresco next to the peaceful lake. We had dinner reservations at 7 p.m. at The Bistro, so after getting settled, our first stop was The Marketplace to do a little shopping before dinner. I picked up a small appetizer plate with the word �Otto� (eight is my favorite number and it�s close to our last name � kind of sweet) as well as a small gift for our baby/dog sitter. The grand, Italian charm is prominent in the post and beam construction at The Bistro. Our dinner was delicious and the wine at Gervasi is always delightful. Our waiter was very friendly and attentive and was able to bring us a bottle of the Abbraccio wine we were drinking with dinner to take back to our room. After retreating to our suite, full and happy, we lit a fire, poured some wine and enjoyed the quiet and each other�s company. The next morning, we were delighted to wake up to a coating of snow over the grounds and a wooden wine box full of delicious home-baked breakfast goodies. It made our departure just as magical as our arrival. Review from the Wine Buzz A Tuscan Escape It�s easier (and cheaper) than you think How about a Tuscan getaway in a romantic villa set by a lake and vineyards, where you can relax in front of a fireplace sipping the estate�s wine until you head out for a rustic Italian dinner, just steps away? How about a Tuscan getaway that involves no car rental, no language barrier, no currency conversion and � best yet � no air travel? Just get in your car and drive to North Canton, to the Villas at Gervasi Vineyard and you�ll forget that you�re anywhere but in a faraway place. Just as no expense was spared in the building of the winery and bistro, which opened in spring 2010, the villas are lavishly appointed to offer the best in beauty and comfort. Colors are rich tones of gold, burgundy, chocolate and crimson. Bathrooms are marble or terrazzo with walk-in showers. Heated stone floors, heated towel racks, wrought iron accents, thick area carpets and original artwork � all in a Tuscan style � make this a truly unique place to stay. There are 24 suites, four in each of the six villa buildings. The three different types of suites include king luxury suites, double luxury suites and 603-square-foot two-level luxury suites. Did we mention luxury? Look no further. Each villa has a hospitality room where guests can enjoy the complimentary continental breakfast. In-room spa treatments are available. Rates start at $199 per night, or you can gather a group of friends and rent an entire villa for about $850. Also new this fall is the Cucina at Gervasi Vineyards, which offers wine and cooking classes. Find out more � or book a romantic Tuscan interlude � at www.gervasivineyard.com. English spoken. Gervasi Vineyard offers a glimpse of Italy and a touch of romance Clevelanders seeking a touch of romance and elegant escape during the harsh Ohio winter season should take a jaunt to Gervasi Vineyard & Italian Bistro in Canton, Ohio where wine, Italian cuisine and cozy villa accommodations await. Canton is approximately an hour drive from Cleveland. Gervasi Vineyard & Italian Bistro Located just minutes from downtown Canton, this family-run winery, restaurant- bistro and Tuscan-inspired villa hotel sits on 55 acres including 5 acres of vineyards that produce several varieties of grapes and a 6 acre spring-fed lake and Bocce courts. The winery produces more than 12 varieties of red and white wines. Samples of the wines can be enjoyed by visitors at Gervasi's Tasting Bar located in the Bistro from 5 p.m. - 9 p.m Tuesday- Thursday, 5 p.m. - 11 p.m. on Friday, noon - 11 p.m. on Saturday and noon - 8 p.m. on Sunday. Free winery tours are offered the first Saturday of each month through April from 2 p.m.- 4 p.m. The guided tours are led by winery employees and last 20 - 30 minutes. Private tours that last 40 minutes can be made by reservation and include a tour of the vineyard, crushing house, winery and cellar and wine tasting. Cost is $85. The Italian Bistro, located in a renovated 1800's barn that now resembles a Tuscan farmhouse, is currently offering an extensive winter menu of rustic Italian cuisine with items like antipasti, brick-fired pizzas, tomato pancetta soup, goat cheese ravioli, Tuscan beef short ribs, pork braciola, Italian meatloaf, chicken marsala, Venetian rosotto, lasagna Gervase, buccatini with meatballs and house-made cavatelli and tagliatelle. For those guests wishing for a romantic getaway, Gervasi's has a variety of luxury villa suites available. Each suite includes a cozy fireplace, a spacious bathroom with a stone walk-in shower and heated towel bars, a refrigerator and heated tile floors. Guests also receive bathrobes and slippers and a complimentary Continental breakfast. Prices for the Double Queen Luxury Suite and the King Luxury Suite range from $179- $289 per night. Cost of the two-level King Luxury Suite runs from $229 - $339 per night. Guests also have the opportunity to take culinary classes and wine classes at the Cucina at Gervasi Vineyard. Culinary classes include demonstration classes where you can observe a master chef at work and get an explanation of their trade and enjoy generous samples of the dishes prepared or hands-on classes where you will actually prepare a meal and get personal instruction from experienced chefs. Wine classes, taught by experienced wine educators, include subjects like a Survey of the Wines of Italy, Great Vintages of France and wines to pair with holiday meals. There is also an "Enjoying Wine Series" with 5 rotating classes. Of course, all classes include wine tasting. You must be 21 to register for a wine class. Check for pricing for culinary classes and wine classes. Gervasi's also has a Marketplace where a variety of Italian- Tuscan merchandise, wine and food products are available for purchase. Hours for the Bistro and Winery are 5 p.m. - 9 p.m on Tuesday - Thursday, 5 p.m. - 10 p.m. on Friday, noon - 10 p.m. on Saturday and noon - 8 p.m. on Sunday. The Bistro and Winery are closed on Mondays. The Marketplace is open 11 a.m. - 9 p.m Tuesday - Saturday and noon - 6 p.m. on Sunday. The Marketplace is also closed on Mondays. Gervasi Vineyard and Italian Bistro is located at 1700 55th Street NE in Canton, Ohio. 330-497-1000. Canton is 59 miles from Cleveland and it is approximately a one hour drive. Treat yourself to a special getaway right here in Northeast Ohio If you�ve been looking for a place to relax and enjoy some time away from the kids, then an overnight visit to Gervasi Vineyard may just be the perfect getaway. With their Tuscan-inspired bed and breakfast suites, rustic Italian Bistro restaurant, Marketplace shop, wines made on the premises, and so much more, you can escape to this slice of paradise just a short drive away in North Canton. On a recent visit with my husband, we knew we were in for a treat as we passed through the stone and iron arched entrance and drove down a beautiful tree-lined driveway on the 55-acre estate. As we made our way to an area called The Village, we pulled up at the Villa Grande, which houses a ballroom, event lobby, conference room and more. This is a great venue for weddings, parties or corporate events. After checking in, we made our way to our Villa, just a short walk away. The entrance leads to a beautiful two-story living room that is shared by all 4 rooms in the villa. This room features comfortable living room seating, dining seating, a stone fireplace, kitchenette and access to a brick patio with a spectacular view of the lake and beautifully landscaped grounds. Our room set-up and d�cor were just as impressive. Amenities included two queen-sized beds, gas fireplace, flat screen television, refrigerator, coffee maker, heated tile floors, walk-in shower and more luxuries than can be listed. We both agreed this was the most nicely decorated, comfortable and well-planned room we have ever stayed in. The Bistro restaurant was just a short walk around the lake. The rustic setting provided the perfect ambiance for our dining experience. The menu featured many authentic Italian entrees, the portions were just right and the service was outstanding. We both enjoyed a couple of glasses of Gervasi wines and topped off our meal by sharing a slice of banana cheesecake. The entire meal was excellent and worth the price. For you real wine connoisseurs, the Bistro also features a Tasting Bar where you can sample their latest wines. The trip would not have been complete without a visit to the The Marketplace, a cozy shop that features gifts, pottery, gourmet foods, Gervasi wines, and much more. For more information on this beautiful vacation destination, visit www.gervasivineyard.com or call 330.497.1000. A Romantic Ohio Getaway Not To Be Missed - The Villas at Gervasi Vineyard in Canton, OH We found a wonderfully scenic, romantic Ohio getaway less than an hour from home - Gervasi Vineyard in Canton, OH. As parents of young children, my husband and I find it hard to escape for a few days just the two of us. Between our girls� activities and our own busy schedules, months fly by before we realize we haven�t regrouped as a couple. I remember reading one of Cindy�s posts about tips she learned to keep a strong marriage � one of those tips was to get away as a couple every three months (you can see her complete post here). I think that is sound advice, and something we as couples need to strive to do. As far as we�re concerned, Gervasi Vineyard is the best kept romantic Ohio getaway secret in the Akron/Cleveland area! A Little About Gervasi Vineyard Gervasi Vineyard is a 55 acre property containing a lovely restaurant and wine bar, outdoor patio restaurant, marketplace, bed and breakfast villa suites, and several larger venues for weddings and other celebrations. All of these top-notch, Tuscan-styled facilities are surrounded by gorgeous landscapes, a spring-fed lake, five acres of vineyards, and miles of walking paths. My husband and I were totally bowled over and taken by surprise with how stunning the facilities and grounds are. At Gervasi, every detail has been attended to. Our Overnight Stay at the Villas at Gervasi Vineyard in Canton, OH A friend of mine had posted on Facebook photos of their room at a recent stay at the Villas and Gervasi Vineyard, so I knew my husband and I were in for a treat. Even with that advanced information, we were impressed. The Villas are structured to remind you of a small Italian Village. Each of the 6 Villas at Gervasi houses 4 guest rooms. The guest rooms flank a common hearth/hospitality room, where guests can relax and chat gathered around the fireplace, enjoy drinks on the patio overlooking the lush grounds, or help themselves to complimentary snacks and drinks in the well-appointed kitchenette. This is also where continental breakfast is served and left for each of the guest rooms. Each guest�s breakfast of pastries, an egg casserole and fruit is stored for them in a sealed wine bottle crate with their room number on it. So distinctive and fun! We were wowed by the facilities! Our guest room was done in Tuscan style, from top to bottom. It wasn�t overdone, though, as some places can be. It felt sophisticated and luxurious, yet comfortable at the same time. Our room was complete with a working fireplace, a beautiful king-size bed with down bedding, and a sitting area and desk. The windows in our room looked out to the beautiful lake. The bathroom was the nicest bathroom we have ever had at a hotel or inn! The photos don�t do it justice either. It had a walk-in tiled shower with dual shower heads, a furniture-like vanity, and one of the most beautiful marble sink tops I�ve ever seen. All the lighting fixtures and accessories were coordinated. Our entire guest room made us feel like we stepped into a home design magazine! The evening we checked in, we decided to treat ourselves to dinner at Gervasi�s Italian Bistro � we were celebrating my husband�s birthday, after all! Thankfully, we had made reservations, as the place was PACKED, even on a Tuesday night! The food was scrumptious. Both the wine and food are worthy of a special celebration. The service was impeccable. After our nice dinner, we took one of the brick trails across the grounds back to our villa. We saw folks gathering in small groups all around the grounds, enjoying the scenery and each other�s company. We felt so relaxed and in-tune with each other. Once in our room, we heard no other guests. It was as if we had the place to ourselves, even though we knew folks were staying across the hearth room from us. It was so wonderful to just be able to focus on one another, sleep in without kids jumping in bed with us, and just slow down, unwind, and regroup as a couple during our romantic Ohio getaway. And on top of all the amazing amenities at Gervasi Vineyard is the fact that it takes less than an hour for us to escape to this wonderful place! As we walked the trails around the property the next morning, we both commented that we felt like we had been transported to a whole other place. We found ourselves wishing that we had at least one more entire day to spend on the grounds. We also felt like we had been away for at least 2 days rather than just 24 hours. It�s amazing what a little one-on-one time can do when in the right place! For us, that �right place� is definitely Gervasi Vineyard.